Fort George is one of the many fortifications that was originally built when the first official British settlement took place in Bermuda. Guarding the vulnerable north shore in St. Georges, the original fort having a single wooden lookout tower was built during 1612 when Richard Moore was the Governor of the island. It was then known as Riches Mount. In 1619, it was destroyed by a hurricane and Governor Nathaniel Butler rebuilt the tower and also installed a 'Warning Gun' in front of the new tower. The lookout tower remained unchanged until the American War of Independence ended in 1783. In 1788 it was completely renovated by the Royal Engineers and renamed as George Fort after King George III. In 1798, two 12 pound guns and two 9 pound guns were installed to further enhance the protection of St. George's Town and the deep water approaches. In 1809 when the Royal Naval dockyard was completed at the western end in Sandys Parish, Fort George went through further renovations and construction completed in 1840. The fort which was finally rebuilt as a star-like structure had a dry moat surrounding it. There were drawbridges joining the main fort building located at the middle. 64 pound rifled muzzle loaders were added at the eastern and western flanks. 11 inch rifled muzzle loaders each weighing 25 tons were brought in from Royal Gun Factory of London in 1871. The fort once used to be manned 24 hours. There was an escape tunnel that was 150 feet long. Located on a hilltop, the view from the fort area is spectacular. You can get a great view of the St. George Harbor and all the way up to the St. David's Island. While the eastern and western guns no longer exist, you can still see a 25-ton cannon from Royal Gun Factory that points towards the Town of St. George. 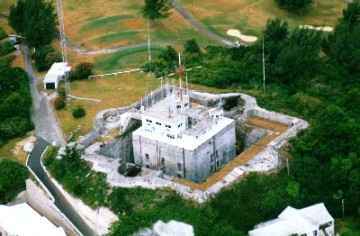 Today the George Fort is the head office of the Bermuda Maritime Operations Center. 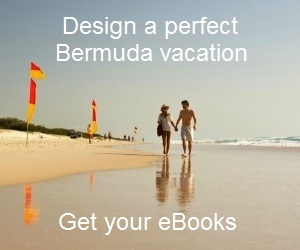 This is run by the Government of Bermuda under the Department of Marine & Ports Services. Today it provides many important services to local and international communities. One of the key services is Search and Rescue (SAR) operation in the Atlantic ocean around Bermuda. 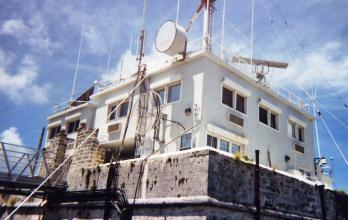 It also serves as the Vessel Traffic Surveillance Center and Coast Radio Station. George Fort is located in St. George's parish and in St George Island. It's on a hill top. But the steep uphill walk is rewarded by the fort with its great historic significance and marvelous view of the harbor. Bus routes #1, 3, 10 and 11 operate between Hamilton and St. George.